Founded in 1991, The Research Group has an established reputation of integrity and creativity! Barbara Gassaway, President and Founder, is one of the nation’s leaders in market research. 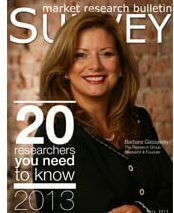 Among other accolades, Barbara is a contributing author to Journal of Market Research and Quirk’s Market Research Review, RIVA Trainer, recognized as One of Maryland’s Top 25 Business Women and most recently identified by Market Research Bulletin as one of the 20 Researchers You Need To Know. Her stellar leadership skills, remarkable insight, and unrelenting stamina drive the mission of The Research Group. The Research Group’s breadth of category experience, perpetual learning practices, and creative, customized approaches are industry trademarks. Loyal clients rely on our ability to be agile and challenge the status quo. Engaged in moving knowledge forward in the health care, consumer, and government contracting industries, our researchers bring the most current intelligence to every project. The Research Group is extremely proud that world-renowned health care institutions, government agencies, CPG, and pharma companies value our contributions to their work. The Research Group is a certified MBE. Observation Baltimore is a division of The Research Group.